On a day when drought-hit West Bengal reported its first suicide by a farmer, the spectre of flood stared at several parts of North India. People living in low-lying areas along the river Yamuna were evacuated in Delhi after the river rose beyond the danger level. 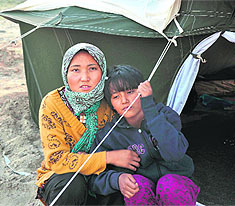 A day after The Tribune highlighted the fate of a 35-year-old Leh woman who lost one daughter to the August 6 flash floods and had no resources left to educate the other, the Union government today stepped in to rescue of the family. The contentious nuclear liability Bill could run into rough weather once again as the official amendments circulated by the government today show that it has again been diluted in favour of reactor suppliers. Government today said it has issued a notice to Internet search giant Google for depicting Pakistan-occupied-Kashmir as part of Pakistan. The Shiv Sena has a new rising star: Aditya Thackeray, grandson of supremo Bal Thackeray is all set to make his political debut under the students� wing of the party. No kiss please, we�re Indian! �Don�t greet an Indian woman with a peck on the cheek�; �cover your knees and shoulders at holy places�� Well, the advisory is no Taliban diktat but a �set of etiquettes� issued to the visitors of the Delhi Commonwealth Games. Centuries ago, India was a global leader in mathematics, with wizards like the Aryabhatta, who gave world the concept of zero, his disciple Bhaskara followed by Ramanujan. But now, it seems, the magic of maths is fast losing its charm.